In the last couple of seasons I have started hunting more and more with a "run n gun" stand setup. This style of hunting requires you to hike in with a stand on your back, set up on the fly, and then tear down at the end of the hunt. There are a lot of advantages to this type of hunting style, and I've come to really like it. Often, the first time in to a spot can be the best chance at a mature buck. Just like anything, there are downsides as well, and today I wanted to review both the pros and the cons of a mobile hunting setup to help you decide if you should adopt this kind of hunting. Increased Mobility: One of the biggest hurdles that a hunter can face is not wanting to move a stand because they've hunted it year after year. Usually this sense of not wanting to move the stand stems from either laziness or the fact that a big buck was shot out of it years prior. In either case, sometimes hunting the same stand year after year can actually be a major disadvantage to you. Having the ability to hunt where you want, when you want can have a major positive impact on your success levels. You Can Adapt To Changes: When you utilize a hang and hunt system, you can easily adapt to changes in the deer woods. What this lets you do is hunt based on current sign, and not preconceived notions, and you can make any changes if things happen in the woods that you weren't expecting. Let's say for instance you hunt an area of public land that normally doesn't receive much pressure. One day you go in for a hunt, and someone happens to have set up right where you hunt. Instead of getting pissed and leaving because you can't get to your stand, if you have a mobile setup with a stand on your back, you can adapt, figure out a new spot nearby, and go hunt. Utilizing a hang and hunt system allows you to adapt to changes deer make throughout the season. The First Time In Is Often The Most Successful: With a mobile hunting setup, you'll likely be hunting more spots and this can bode well for a number of reasons, with one being that you'll have more "first sits." Many times, the first time in a spot is your best chance to harvest a mature buck, and every time you hunt that spot from there on out, your chances get slimmer and slimmer. By running and gunning, you'll be hunting more fresh ground, and this could lead to higher chances of success. Got Busted? : I'm going to run through a quick scenario with you (and know this isn't always how it works, but I've heard it time and time again from many hunters). You go into a hunt, knowing you're in a great spot. You have the buck you are after make his way into you, but he catches you drawing your bow back, and busts you. The next night, you have the same conditions, and decide to go back to the same stand, except this time you don't see him, and decide that he won't be back for a long time after busting you. What really might of happened though is the buck did return, but this time he was downwind of you and out of sight, smelled you, and moved off without you ever seeing him. If you had a run and gun setup, instead of going back to the same stand on the second night, you could have shifted your setup to anticipate the buck returning, and this time be much further downwind. You make the quick change, and you might put yourself in position to have an encounter you otherwise would never of had if you weren't running and gunning. You Need To Be Really Proficient With Your Setup: If you don't practice and become really good at hanging your mobile setup quickly and quietly, you can easily ruin a hunt. Often times, being able to do a hang and hunt is predicated on two things. Efficiency and quietness. If you are taking forever to get a stand up, fumbling around, etc. this will only hurt your chances of having an encounter with a mature buck. This really leads in to the next point of being quiet. In order for a sit to be successful in a stand you literally just hung, the last thing you want to do is be making a whole ton of noise. The same can go for pulling a stand at the end of a hunt. The louder and more noise you make, the more deer you could be alerting. My piece of advice is that if you want to hunt with a mobile setup, make sure it's quiet, and become as comfortable as you can hanging it and pulling it down. 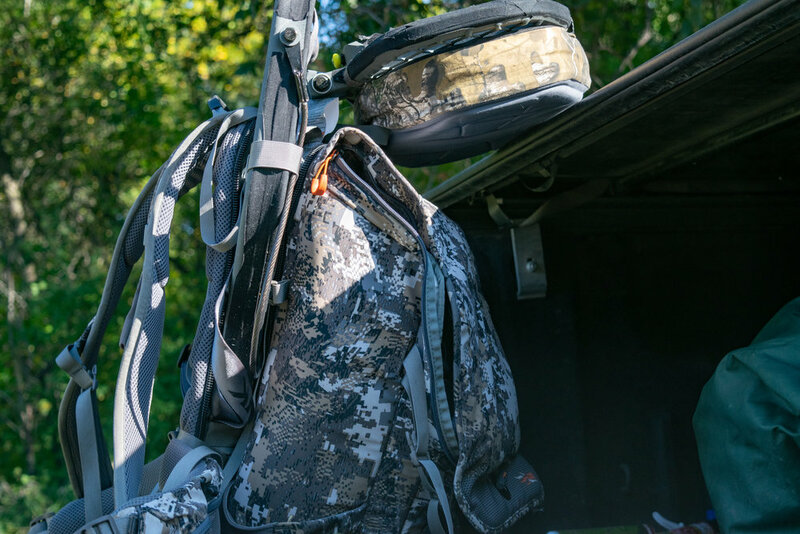 Easy To Write Off a Spot: When you become a mobile hunter, it's easy to have a list of spots that you want to hunt and check out, and you might want to move through that list and hunt as many areas as possible. Just because you have the ability to hang a stand anywhere, don't write a spot off just because you didn't see what you wanted to on the first sit. Though your fist sit can be the best time to tag a mature buck, whether it be weather conditions or something else, your first time somewhere might not produce. If you go into an area, see the sign, and think it's truly going to be a good or even great spot, give it a few sits before deciding to move away from it completely. Maybe bounce around in the same general area, but if your gut is telling you it's a good spot, give it a fair shot before deciding you're going to hunt somewhere else from here on out. A Lot To Haul In: At the end of the day, some people simply don't like carrying more in with them on a hunt than they have to. When you are hunting via run and gun, you are inherently going to be carrying in more gear with you. Between a stand, sticks, tow rope, bow hangers, etc. it can get to be a lot. Especially if you are someone like me who self films and then you add all of that on top of it, ones pack can start to weigh a heck of a lot. If you are someone who wants to quickly slip into a spot and out of it with minimal effort, a hang and hunt might not be the way to go. Overall, just like anything with deer hunting, a mobile hunting setup is all situational. I've got some spots all ready to go for the year, and in other places I'll be utilizing my run and gun setup. Whether or not you want to implore this type of hunting might be dependent on what you value between these pros and cons.